The Champagne corks popped at full-time and the post-match beer flowed, but the newly-crowned league champions were careful not to get too carried away. On Saturday, Melton travel to the south of Leicester to face Leicestershire rivals Vipers in the Midlands Senior Vase final (kick-off 2.15pm). As well as local bragging rights, a place in the national semi-finals is, perhaps, the chief motivation. Head coach Gareth Collins, speaking after Saturday’s final whistle, said: “It’s very much job half-done and we will be back to work to prepare for the final. “The hardest thing this week was to get them focussed on today and not thinking about the cup. “We have prepared fantastically for every cup game and have earned our place in the final. For the moment, coach and players have tried to keep a lid on the looming possibility of a national final at Twickenham in early May. Several weeks ago, Melton were heavy favourites to win the Midlands crown with Vipers modestly placed in the Midlands Three East (South). Five straight wins has propelled Vipers up to second and reduced their odds of lifting the Vase. But Melton crushed league leaders Rushden 41-3 in round two, and Collins is confident of progress. 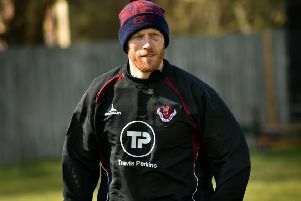 Assistant coach Stu Morley added: “We have gone away to places which on paper appear tough games. “In the Midlands semi-final we played Woodrush who were an unknown quantity to us. We had to go away and play those guys and it turned out it was an easier game than we were expecting. The club is running a supporters’ coach to Vipers. Tickets are available at £5 from the Melton RFC clubhouse or by calling (01664) 563342.